Anytime of the year is great for visiting the Great Barrier Reef, in particular we love the months from October to December, when the weather is generally clear & fine, winds are low and visibility at its best. A typical North Queensland tropical climate brings clear, fine days during our 'Winter' months (June - August), and hot and humid conditions during our 'Summer' months (December - February), with much of our annual rainfall falling between January - March. But don't worry if does happen to be raining on the day of your reef cruise, its more the wind and swell that determines the quality of your day, not so much the rain. In most cases the rain tends to draw towards the mountains, leaving the reef clear and fine of the day. Water temperatures are typically warm and comfortable year round, ranging from 23°C in the winter to 29°C in the summer. View detailed forecast graphs here. Cairns is accessible from virtually anywhere in Australia by air. 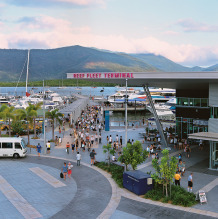 The Cairns International Airport services international and domestic airlines as well as general aviation and a number of helicopter operators. Domestic flights travel to Cairns from all over the country including all capital cities, regional Far North Queensland and tourist destinations such as Uluru (Ayers Rock). Carriers include Qantas, Jetstar, TigerAir, Virgin Australia. International airlines servicing the Cairns Airport include Air New Zealand, Air Niugini, Cathay Pacific, Silk Air. 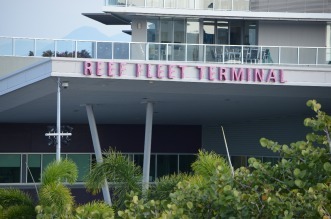 The Reef Fleet Terminal is the main departure point for all reef trips. 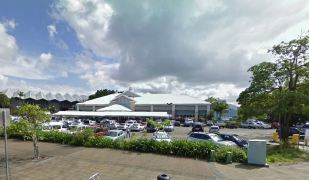 Check-in is located at 1 Spence Street Cairns, which is just next to the Shangri-La Hotel at the Pier Marketplace. Some reef trips board directly onto the vessel, you will be advised this on booking, along with your boarding/check in time. Coach transfers from your accommodation can be arranged or we recommend taking a taxi. For self drivers, Council parking is available outside The Pier, or you can park undercover at the Casino or The Pier for about $10 for the day. 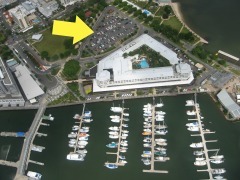 There is also all day parking at the outdoor carparks located near the Cruise Liner Terminal on Wharf Street, about two blocks away. Helicopter flights depart from the Cairns Esplanade. 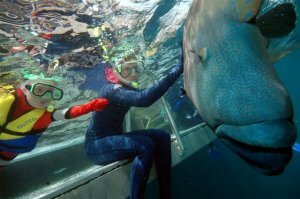 Below is some information on the most suitable trips to the Great Barrier Reef for wheelchair passengers. We recommend calling our office or emailing as much detail as possible in advance, so that we can reconmmend the best trip option to suit your individual requirments. There are occasions when certain vessels may not operate, so by providing us with as much information as possible, and reconfirming your booking within 24 hours will help us ensure that you have the best Great Barrier Reef experience ever! Green Island is accessible for wheelchairs, however not all transfer vessels are able to accommodate wheelchairs. Once on the island wide paved and timber pathways allow wheelchairs to move around the island and through the island facilities. 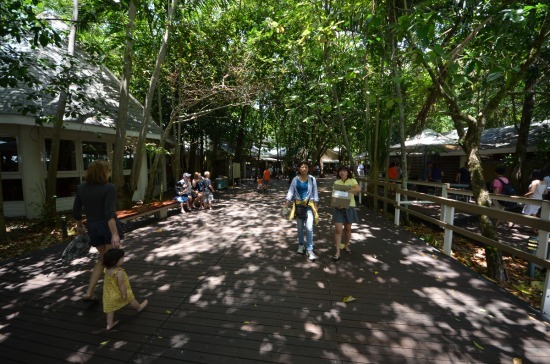 There is also an eco boardwalk that takes you directly through the rainforest into the centre of the Island which is easily accessible. Disabled toilets are available on the island also. 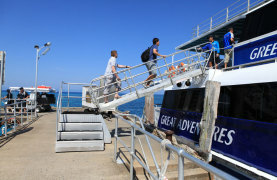 Big Cat Cruises visits Green Island daily and has limited wheelchair facilities onboard. Passengers must have some mobility and/or the presence of a carer who can assist them. 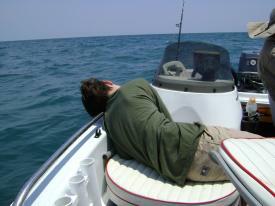 Depending on tides it may be necessary to embark/disembark from different levels on the boat. Toilets on the vessel are not wheelchair accessible. Coral viewing and glass bottom boat activities are subject to the weather and the extent of the passenger’s mobility and/or the presence of a carer who can assist. Big Cat Cruises are not able to accommodate electric wheelchairs on any of the vessels or coaches. Depending on tides and weather conditions, gangways from the vessel to the jetty are sometimes too small for a wheelchair and will at times have a few steps from the end of the gangway to the jetty. The gangways are able to accommodate standard sized wheelchairs, however larger motorised wheelchairs may not be able to be accommodated. 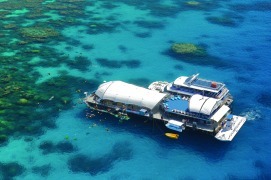 The glass bottom boat is only accessible via a number of steps (and is not able accommodate a wheelchair). There is ramp access from the wharf to the vessel and vessel to the Marine World platform. However, passengers are required to negotiate at least one set of stairs on the vessel depending on tides and loading position so the assistance of a carer is highly recommended. The Reef Magic II catamaran has wide isles and a wheelchair accessible toilet & shower. Access to the water, coral viewing vessels, underwater observatory and sundeck all require stairs to be negotiated and would require a carer to be present if unable to walk unassisted. 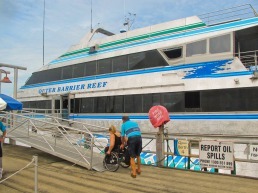 Great Adventures vessel "Reef King" does have a motorised chair lift to enable transfer between the upper and lower decks, however it is recommended that passengers have some mobility or assistance to transfer from their wheelchair. Toilets on the vessel and outer reef are not wheelchair accessible. There are ramp facilities from the vessel to the floating platform. There are no disabled facilities on the platform and the platform does have decking where wheelchair wheels may get stuck. Access to the underwater observatory, swim platforms and semi-submersible is by stairs only. Quicksilver VIII is the most suitable vessel for wheelchair passengers, however there are occasions when this vessel may not operate which is often not known till 24 hours prior to departure, so it is recommended to reconfirm your booking prior to travel. On Quicksilver VIII there is an oversized toilet cubicle suitable for most wheelchair passengers. Quicksilver V also has a wheelchair accessible toilet. 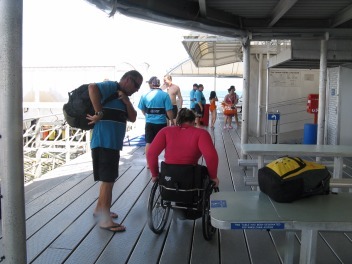 At the platform a chair lift enables disabled passengers to be lowered into the water to enjoy snorkelling. 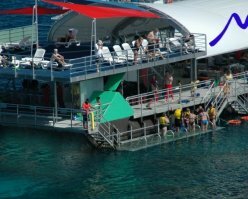 There are ramp facilities from the vessel to the floating platform, however access to the underwater observatory, swim platforms and semi-submersible coral viewing vessel is by stairs only. 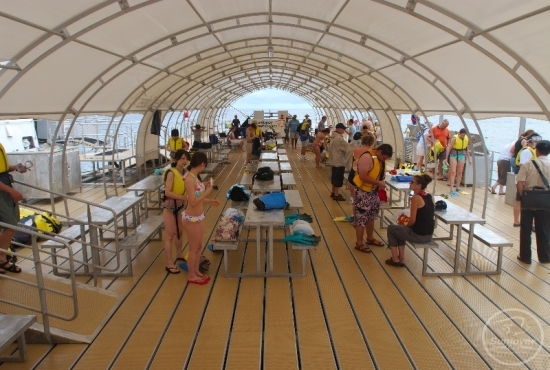 Sunlover Cruises is very well set-up to accommodate wheelchairs. They have multiple entrance points onto the vessel, as well as a dedicated wheelchair table on the main deck, wheel chair ramps to get over door jams and very experienced and willing crew. 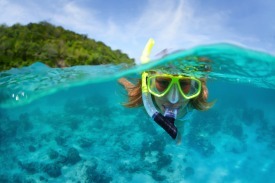 In some circumstances, they may be able to offer glass bottom boat rides and even SCUBA Diving! but cannot guarantee this every time. You may notice an EMC surcharge alongside your reef trip booking. All tourism operators are required to collect this payment on behalf of the Great Barrier Reef Marine Park Authority (GBRMPA). All funds received are applied directly to education, research, ranger patrols and policy development. If you're sensitive to the motion of the ocean, then it's best to be prepared rather than let a bout of seasickness spoil your trip of a lifetime! Reef locations are generally picked to provide plenty of shelter from the ocean swell, once you're in the water things usually settle down. Before you go, head on down to Reef Teach, showcasing a fun evening presentation on the Great Barrier Reef, to enhance your Great Barrier Reef experience. This informative and entertaining evening will have you laughing about the funny facts and weird and wonderful ways in which the reef works! Learn what to look for, where to find it and how to discover as much as possible. 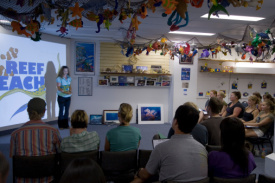 Reef Teach shows are held Tues to Sat from 6.30pm – 8.30pm. Includes: Fish and coral identification sheets, tea, coffee & biscuits! 1. Snorkel with a buddy. 3. Wear a stinger suit. 4. Wear floatation if not so confident in water. 5. Spit & rinse your mask first to prevent fogging. 6. Make sure that your mask strap is not too tight. 7. Ensure hair is out. If you have a moustache, ideally, shave it off. Or use a lubricant like petroleum jelly so water does not come in via the gaps between the hair. 8. Adjust snorkel. Be aware that at certain angles your head can go underwater with the snorkel and it will turn in to an oversized drinking straw. 9. Choose fins that are snug but not too tight to avoid cramps. 10. Don’t smile! If you smile it will let water into your mask! 11. Relax & have fun!